Ever since I made Domo Cooking (Internally) I've wanted to try another cooking episode because the first wasn't really what I had in mind. The story just kind of followed a path of it's own. I was also unhappy that Domo wasn't in a proper kitchen. 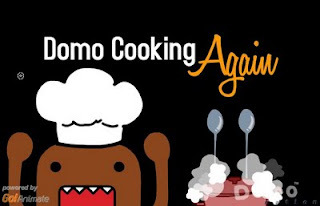 Finally I've completed Domo Cooking Again (see animation embeded below), which I started quite some time ago and kind of got side tracked. This time Domo has a full kitchen and is aided by his capable assistant, Tashanna. Once again the storyline kind of went off on a tangent that wasn't there when I started. However these things happen once you start feeling the pinch of the limitation of movement the pre-made Domo Animate characters have. I was originally hoping I'd be able to have Domo do some actual cooking this time around but I still haven't come up with a satisfactory way of getting him to pick up and put down objects. If I was doing this on GoAnimate I'd be able to make some custom Domo arms and fake it a little with them but unfortunately Domo Animate doesn't allow custom... anything! In the end we get what you see. For some reason both Tashanna and Mr Usaji have the mystical ability to bend spoons so I used that to suggest, somehow, that Mr Usaji had tampered with Domo's cutlery. It kind of works as a joke. I also like the interaction between Tashanna and Domo. I think I'm getting the hang of helping the audience understand what Domo is saying through the technique of using the surrounding characters to semi translate. As I said this still isn't quite what I had in mind for a cooking episode so I expect I'll eventually give another episode a try. Once I've worked out how to fake Domo's hands picking things up and carrying them.